Some years I bake for the holidays. In select years past, December found me content, organized, focused and flush enough to buy ingredients to bake a variety of items for my friends and family. Sugar cookies are easy because they come in a tube (although you can always burn them, in fine Bad Home Cook tradition). I used to love making bourbon balls. Two years ago I made ginger stars - ginger cookies shaped as stars - to the delight of my children. It was all I could do with the scraps left over from my attempt to make gingerbread men for them. It was the highlight of the year, as I recall. The trouble with holiday baking, however, is that it often requires decorative frosting. A dawdle for most holiday bakers, no doubt. But to me, it's another simple recipe for me to bollix up and embarrass myself with. I know I'm not the only one to be ginger-bread-house-challenged. In her yummy blog, What Did You Eat?, Sher acknowledges the various pitfalls awaiting the untrained. But then she's trained. And she eventually comes out on top. 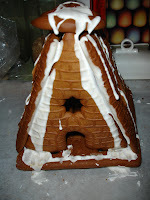 In early December my children started agitating for a gingerbread house. A *real* gingerbread house, of the sort you see in Martha Stewart Living and in various glossy magazine ads. My Aunt Dorothy used to make the most amazing gingerbread houses - all covered in gumdrops and held together with thick white, paste-like frosting she'd squeeze out of a pastry tube. I gave the idea some serious thought for a few days. I did make gingerbread once. Why couldn't I make a few slabs and improvise? Maybe I could start a nice holiday tradition. I'm big on those, since I didn't grow up with any myself. Then I stumbled upon a pre-made gingerbread house kit at Trader Joe's and realized that, judging from the way my kids were falling over each other in excitement, a store-bought house would make them just as happy. It was a big triangular box, with instructions on the back in German. I decided to splurge. Inside the box came four ginger-bread like slabs, a dozen colored hard cookies of various shapes and sizes, and two little candy characters, a mom and a little boy, presumably for decoration. But, as always happens when you buy a box intending to assemble the contents within, some key nut or bolt is invariably missing. In this case, it was the frosting. It hadn't occurred to me that a pre-made gingerbread house wouldn't come complete with a plastic bag of stay-fresh frosting-flavored product. It didn't make sense. It was bad marketing. Why would someone buying a pre-made holiday tradition want to make their own frosting? That's why you buy a gingerbread house in the box. You want it all there for you. Didn't they realize the paradox here? 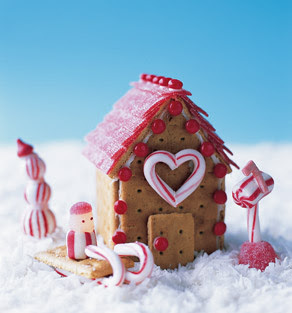 If I could make frosting then I could presumably make my own damn gingerbread house. Right? RIGHT? It's not like the Germans to overlook such a key detail. But it was too late to turn back. I'd already opened the box -- in front of my kids, who were watching, waiting for their mother to do something magical for their holiday. Crap. I had no choice. I had to go in. Upon quick reading, the recipe was simple enough, but it dealt with meringue, which deals with egg whites, which really, if you're a novice, isn't that easy. For example: I dimly remembered how to crack an egg and pass the yolk from side to side over a bowl to catch the ick (the egg white). It was one of the many valuable skills I learned in my junior high school home economics class. Likewise, I thought I remembered that whipping egg whites would eventually turn them fluffy. In any case, the directions did call for "making them stiff." Ya Woll! I whipped those egg whites with a wooden spoon until I broke out in a sweat and I could see that I would be getting nowhere fast. I whipped out the electric mixer. And mixed until things indeed got stiff, about 10 minutes. With A. reading the recipe out to me, I added the sugar, and then the lemon juice and the vinegar. I had just dumped the liquid in when Annie held up her hand. "Wait!" she said. "It says here lemon juice OR vinegar." Damn. Trying to blot out the extra liquid with a paper towel, predictably, didn't do much, and that was that. My frosting was nice and white and fluffy and had the consistency of whipped cream. But would it hold a house together? You can judge for yourself here. "Mommy, why doesn't our house look like the one on the box?" asked my son. "You ask too many questions," I said, and handed each child their own candy character to eat. This placated them for the evening, and I let the house sit on the counter for two days before slipping it outside into the trash when they were at school. I redeemed myself a week later, however, when I helped my son's first-grade class make their own gingerbread houses. We all brought candy to decorate them with, and the teachers whipped up a huge tub of thick, white frosting, the consistency of glue. Their secret? There's an icing mix you can buy, apparently, at specialty baking stores. I plan to investigate this closely for next year. Hilarious!!! My friend who has a gingerbread decorating party each year uses canned white frosting and it works great. What could be easier? And it dries beautifully. All my decorations are stuck like glue to the gingerbread house. P.S. Thanks for mentioning my blog!